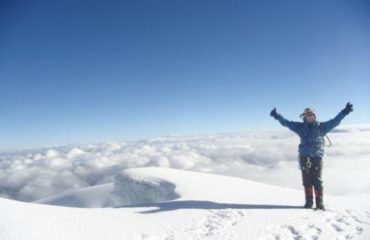 A 9 Days excursion to the Cotopaxi summit in the province of Cotopaxi. From 2 up to 20 participants (there will be a guide for every other participant). All about the Cotopaxi Summit 9 Days. 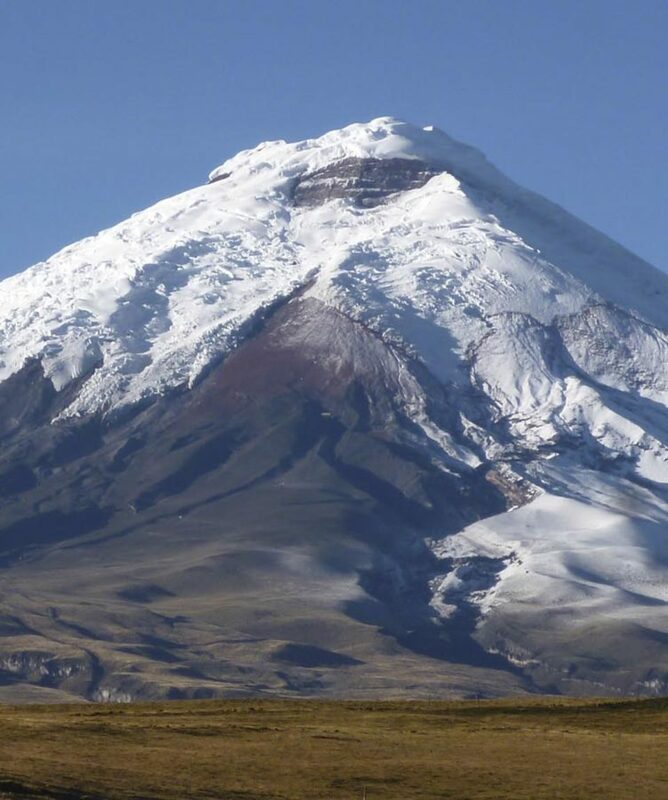 The ascend of Cotopaxi is an excellent introduction to high-altitude mountaineering and a great option for more experienced climbers who have time restraints. 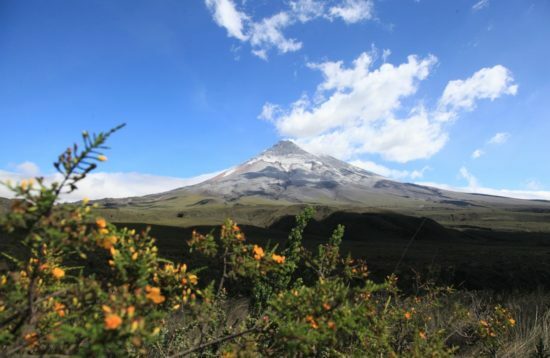 This expedition will lead to the summit of the highest active volcano in the world and the second highest mountain in Ecuador in only a week. 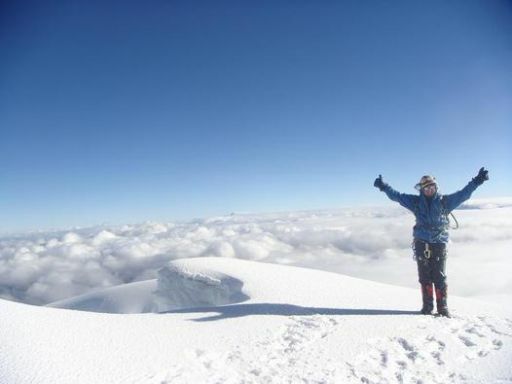 Ecuador is one of the best places in the world to develop skills in high-altitude mountaineering. Therefore, there will be two days dedicated to developing these skills before the attempt to summit this beautiful and inspirational mountain. Besides offering unique opportunities to satisfy your dreams to climb, Ecuador is a country rich in culture and history. The people are very friendly and you will feel welcomed and comfortable throughout your trip in this marvelous country. This adventure is designed for you to see and experience the best of Ecuador not only by climbing in the mountains but also by being exposed to the culture. We will visit Quito and it is colonial section as well as Otavalo with the famous indigenous market. Accommodation in the refuge Basic climbing equipment (plastic boots, crampons, piolet, harness). Accommodation and meals in hotels and restaurants in Quito. Transfer from and to the hotel in which you’re staying. Leave the United States or Europe and arrive in Quito (9.000 ft/2800 meters). Picked up at the airport and taken to the hotel. We will visit the colonial part of Quito with beautiful churches and historical sites. In the afternoon, we will drive to the north of Quito heading in direction to the small city of Otavalo. On the way we shall pass the small equator monument. Afterwards, we will continue our trip until we reach the town of Otavalo (2.600 m). We will spend the night in the hotel, which is considered the best in town. After a splendid breakfast, we will take our first acclimatization trek on the mountain, Cotacachi. 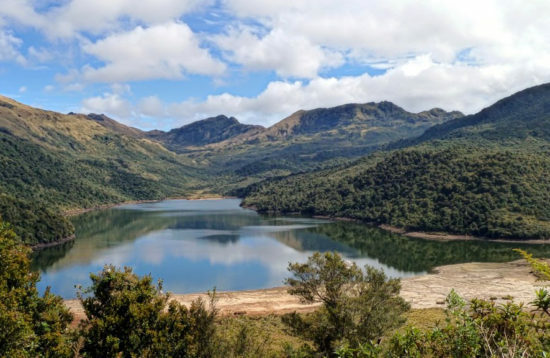 We will walk to 4.500 meters where we will have a panoramic view of the Cuicocha Lagoon in the crater of the ancient volcano at the feet of Cotacachi, the Imbabura volcanoe and the snow-peaked mountains of Cayambe and Cotopaxi in the horizon. The walk will take five hours. We will return to our hotel in Otavalo to relax in front of the fireplace with a mug of coffee and enjoy a dinner with live Otavalian music. Otavalo is known for its indigenous market, which is considered the most famous in South America. In the morning, we will visit it in order to collect a few souvenirs and admire the colorful tapestries, sweaters, ponchos, jewelry, and displays of ceramics in the plaza of these skilled artisans. 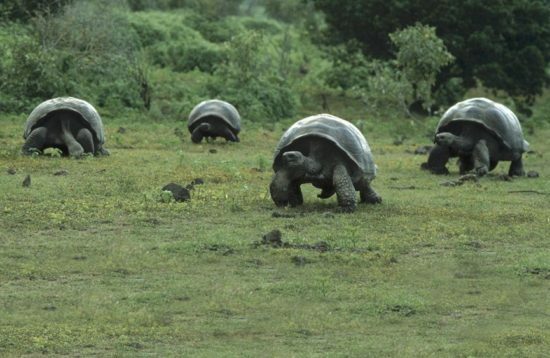 In the afternoon, we will cross to the southern hemisphere in the direction of Tambopaxi. This is comfortable place to acclimatize as it is at the base of the extinct volcano Ruminahui with an elevation of 3700 meters in the Cotopaxi National Park. From here, the view of the north face of the volcano Cotopaxi is amazing and inspirational. 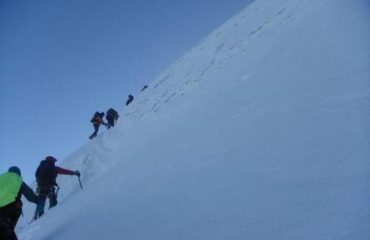 In the evening, we will prepare for our technical mountaineering training, which will take place the following day. Our private transportation will take us to the park at an altitude of 4.600 meters. From there, we will have to climb approximately an hour to the refuge and the closest glacier (4.800m). 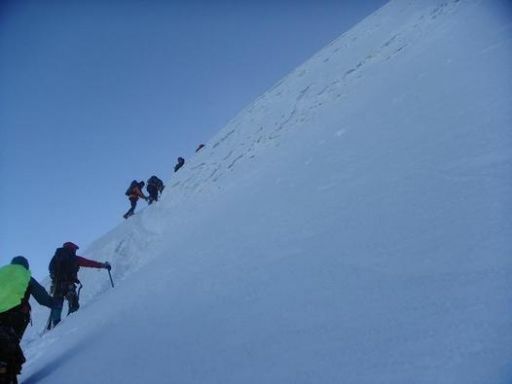 Once at the glacier, we will practice and learn basic mountaineering techniques and advanced climbing on snow and ice, self-arrest, managing the rope, glacier travel, and self-rescue. We will return to Tambopaxi in the evening in order to honor the mountaineering rule of “climb high and sleep low”. We will move to the Jose Rivas Refuge. On the glacier, we will reinforce our practice from the previous day and then prepare to leave at midnight for the summit. We will rise at midnight and begin the ascent at 1:30 in the morning. We arrive at the glacier (5.080m) in approximately one hour. The sunrise over the sea of clouds that cover the endless Amazon rainforest, can be enjoyed to the fullest. Once at the summit, we will recuperate while looking at the fabulous views of the active crater with a diameter of 800 meters and a depth of 300 meters. The mountains that are visible in the panoramic view include Antisana, the Illinizas, Cayambe and Chimborazo. We will rest in the refuge and then return to our hotel in Quito. 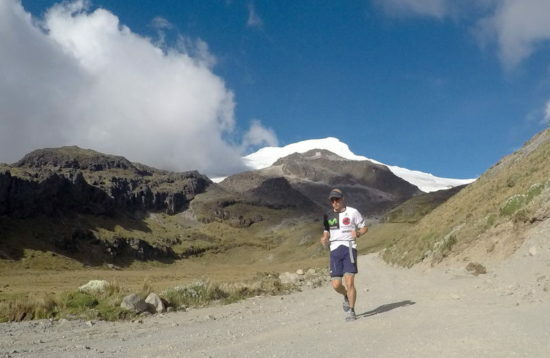 Extra day to allow for bad weather or a free day in Quito. Farewell dinner in Quito. Leave Quito and return home.